Srikanth & Alex began discussing on decreasing the turnaround time and decreasing the inaccuracies coming in accounting and began building a process. They did some research on why this is happening and they found that the main reason is not availability of proper software, but the knowledge and the training of people who were using it as the software is not very easy to use and many of them avoid using the software and using manual methods and input the data into the software without completing the sequence that needs to be done and hence the data comes out as incomplete and inaccurate. This research was extrapolated to multiple other clients and they found out that this issue existed in all countries with all types of companies. Srikanth talks about building the initial sets of features by creating XL templates and sent it to people. This, he found out made the job so easy because the non-technical accounts understood that the specific cells with specific colours can be filled based on certain rules that were typed in the xl sheet and reduced the error by at least 25%. This became the foundation of the product as they found that this problem exists globally with all the clients. The second important aspect identified by their research was that existing software accept whatever the user inputs without checking for accuracy and compliance. These software did not provide a mechanism to verify transactions before posting to ledger. These accounting software lets the user process transactions only when they get ready for accounting, but does not allow the users to get them ready for accounting. Srikanth quotes a simple example where for accounting a purchase of printer cartridge, existing software do not let the users validate if the item is permitted for purchase, is the purchase approved, is it within budget, is the vendor approved, etc. As a result these issues routinely crop up during accounts closure and audits creating lots of issues repeatedly. IDOS helps even the non-accounting users to manage both accounting as well as compliance and helps them to avoid errors at an early level and corrects these issues at the very inception of the transaction. Since this is a pain point that the two of them personally experienced, they were able to correlate it with customers and found out if this will suit a larger market . They got selected at Microsoft Ventures (batch 2) and built their MVP there with an interface based on market feedback giving the look and feel functionality of XL with a row and column functionality and gave it to the initial set of customers, took their feedback and found out what are the main things customers looked out and not looking out and in beta and learnt what they should not do and not have. They realized that clients find it difficult and complex if there are too many features and developed the perfect product to balance features, usability and costs. They also took an important decision on the pricing as they realized that the software right now provides information at a corporate level and companies were exporting the data into xl to do analysis at either a branch level or at a project level and hence the entire IDOS architecture gets processed branch-wise or project-wise and the product pricing is also linked to branches and not number of users, making IDOS a very affordable solution. Since Srikanth had his existing set of customers and Alex had his existing networks , they went to their known people and begin taking feedback even before the MVP was ready and they had people ready enough to test. Keeping in mind the cost, service component of the product and also to gain scale the founders took a strategic decision that they will focus on channel sales and identified their first few channel partners as Chartered Accountants and began selling through them. IDOS provides significant portion of customer support through its channel partners, thereby providing alternate revenues for the professional firms which helped them in getting initial sales and market traction. Srikanth’s advice to start-up founders– Know about your strategy, product or sales strategy and don’t try to create sales strategy to convince potential investors or to raise VC money. The only person who matters the most about your sales strategy are your customers because they are the ones who are paying money. Customers should be happy about the product. He recollects that they would have almost changed their strategy because a few experts wanted them to change. One specific example, he quotes, is his decision to go to South America to launch IDOS, after winning a grant from Government of Chile. He was advised against taking the grant and going to Chile and he was told that it will be a waste of a year and nothing good will come from it. He was also advised against going to South America as the experts believed that the product would need lot of customization for that market. But he said that he bit the bullet and moved over and this is the best decision he took because the market there in that part is very similar to the Indian market competition was limited and the initial users were very excited about IDOS. Further IDOS was able to identify and create excellent channel partnerships with local accountants who would take IDOS sales forward even after Srikanth returns to India. He even proved the naysayers wrong by launching the same product without any customization in the South American market, proving that language of accounting is same everywhere. Interestingly, he is building the South American market without spending any money because he had grants from the local government. Always take customer feedback as the most important feedback and not the feedback from experts. His ensured that India sales initiatives were not affected during his absence by having a core team member focus on Indian market. 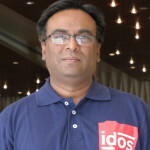 IDOS (https://www.myidos.com) has around 140 companies having multiple branches all over the world using the product and even companies using the top end ERP’s prefer using IDOS accounting package in their branches and then importing it in the ERP. They got membership into SAP start-up focus, got featured in Nasscom Emerge 50 product of 2014 and also was a cohort in StartupChile 10th Batch and was featured in Times of India and Young turks to name a few. They also raised a Seed fund in Singapore. Now they are doing a Spanish version of IDOS to expand their sales and presence in Chile, Argentina, Mexico, Peru, Columbia and Bolivia.